I mean, we didn’t really have a choice, did we? Last year’s flower photo session with my son was such a blast, and with the threat of snow in the forecast, it didn’t take too much arm twisting to get Gabe to model for me again this year. I didn't even have to bribe him with pizza this time. When we first arrived, he posed for a few artful and more cinematic feeling photos. And then it was time for him to just be a boy. The "personality" shots... all him. Gabe even snapped a few shots of me -- he's got a fantastic eye! If you missed last year’s post it was equally silly, creatively inspiring and totally fun. HERE it is if you'd like to see! Man... I just realized this kid of mine is going to be needing his high school senior pictures this upcoming season!! Despite the "snow" (which wasn't as big a deal as predicted), there's still color out there with which to play. 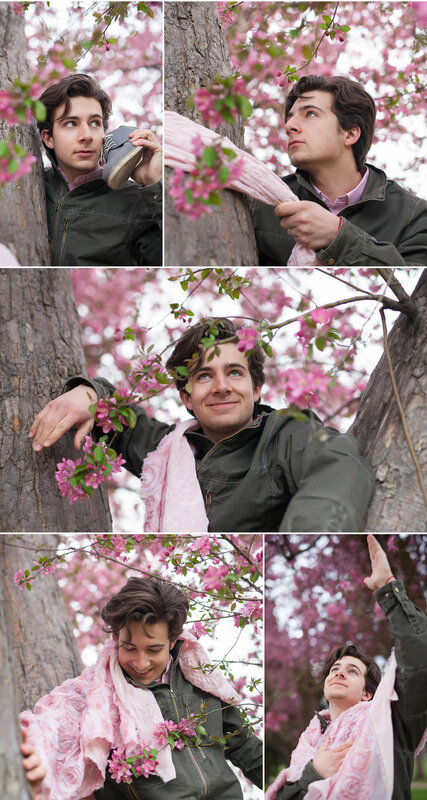 If YOU would like some creative spring flower portraits -- buzz me asap! This incredible wonder of nature in the city will go quickly and is a spectacular backdrop for child, family or personal fine art portraits!! I'd love to photograph YOU out here before it's all gone!